All Denby 16pce Box Sets Include Free Shipping This Denby Tableware 16 pice dinner service includes: 4 Dinner Plates 4 Soup/Cereal Bowls 4 Mugs 4 Tea Plates <h='http://www.shopcookware.ie/denby/68cat.aspx' class='seo_link'>Denby stonewareprovides plates, cups, side plates and other cooking utensils andserveware; all you need is the imagination to create a divine table setting that will get your family or friends firmly in their seats come dinner time. Setting up a dinner table is easy; creating an unforgettable experience is another thing altogether. Follow our tips and enjoy a delightful dining experience on any day of the week. 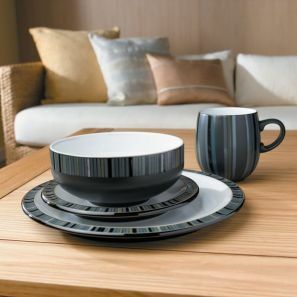 Other items that can compliment a dinner table include a colourful tablecloth or table runner, unique <h='http://www.shopcookware.ie/denby-linen-dinner-plate/den016010005pd.aspx'>Denby stoneware platesand even names to assign each person to the correct seat. Make dinner time the best time of the day with you and Denby.